Free Shipping Included! 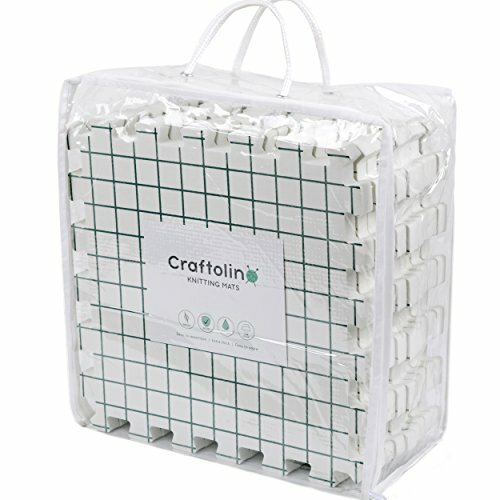 Craftolino Blocking Mats for Knitting - 9 Extra Thick Boards With 1 Inch Spaced Grid - For Needlepoint or Crochet - With 100 T-Pins and Convenient Storage Bag With Handles by Craftolino at Designers Artists. MPN: BMFK9sheets. Hurry! Limited time offer. Offer valid only while supplies last. In Craftolino we believe in producing best in class products to make all your knitting and crochet projects look and feel professional with ease. 100 T-Pins - T-Pins pins included to hold all your projects in place. BONUS 100 STAINLESS T-PINS AND CARRY BAG WITH HANDLES - Keep your knittting blocks safe in an easy to clean PVC bag with handles to carry your crafts with you or conveniently store them. Included are 100 stainless easy to handle T-Pins so you can start with your projects. If you have any questions about this product by Craftolino, contact us by completing and submitting the form below. If you are looking for a specif part number, please include it with your message.